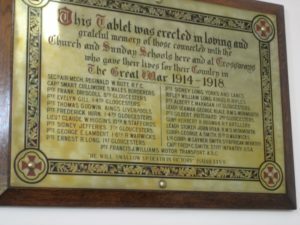 This Tablet was erected in loving and grateful memory of those connected with the Church and Sunday Schools here and at Crossways who gave their lives for their Country in The Great War 1914 – 1918. 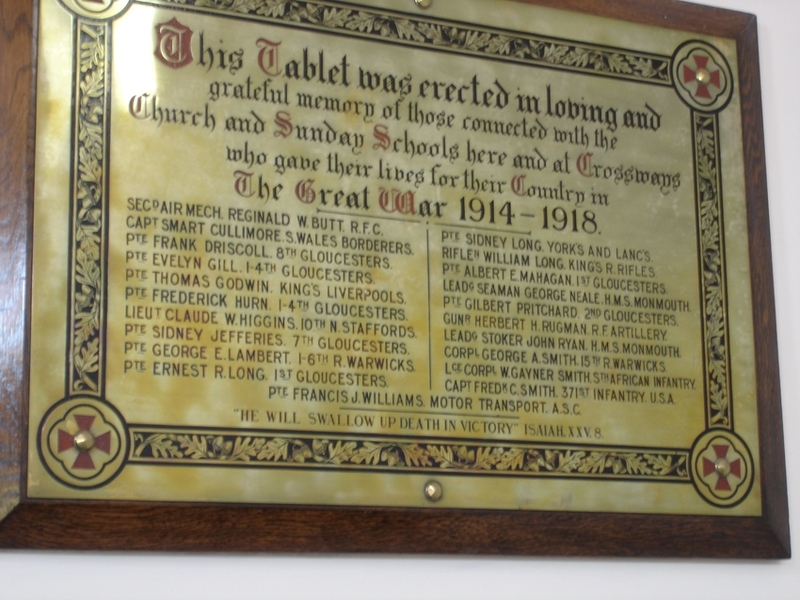 Please click on the names listed below to read more about these servicemen. It is sad to note that three of these were sons of one family, that of Robert and Clara Long. Another family, that of Thomas Cox Smith, lost two sons. Capt. Smart Cullimore, S. Wales Borderers Riflen William Long. King’s R. Rifles. Pte. Ernest R. Long, 1st Gloucesters Capt. Fredk. C. Smith. 371st Infantry. U.S. A.
Pte. Francis J. Williams, Motor Transport A. S. C.
“He will swallow up death in Victory” Isaiah. X.X.V.8.